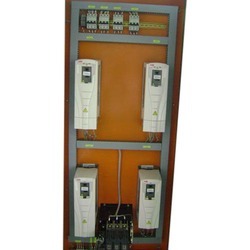 We are engaged in manufacturing and distributing of Variable Frequency Drive (VFD) Panels can be adjusted according to the speed of the motor required in all the process industries and machinery manufacturers. These can be used as energy saving device for some of the machines to save power during no load or it is used as final control element of the closed loop control application where the speed of the motor is changed to control one parameter. The open loop control application is provided with manual speed control of the motors.